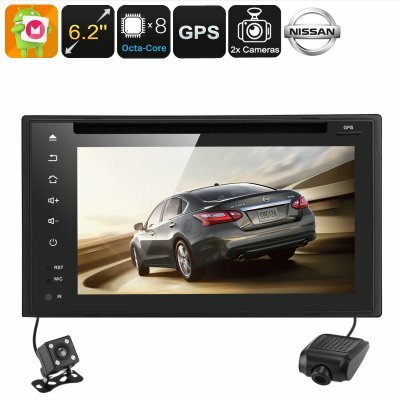 Successfully Added Nissan 2 DIN DVD Player - 6.2 Inch Screen, Android 6.0, Octa Core CPU, GPS, Bluetooth, Car DVR, Parking Camera, Region Free to your Shopping Cart. Region free DVD player supports all you musical and video disc library. GPS navigation takes the stress out of driving. This 2DIN car DVD player lets you enjoy the ride. It puts a powerful sound system, GPS navigation, Bluetooth hands free, and DVD entertainment into your Nissan. The region free DVD player ensures your audio and video discs will be supported no matter where your bought them from. You'll also be able to play direct from the USB ports using a memory pen or SD card reader or alternatively tune in your favorite channels across AM and FM frequencies. Boasting an octa-core CPU with 2GB of RAM means this Android DVD player delivers a seamless performance. With a 6.2 inch touch screen and running Android marshmallow this car stereo and DVD player brings you more from your car. Great audio and video entertainment await you while GPS navigation ensures you will be guided from A to B effortlessly. This Car DVD player comes with its own DVR as well as a rearview parking camera. So not only do you get great audio but you'll have video surveillance to record every event around your car. Now if the worse happens you can prove who was a fault and stop fraudulent insurance claims before they arise. You'll also find parking that much easier as the rear facing camera offers you a clear view from the back without having to turn around. so you really do have eyes in the back of your head. Sync your iOS or Android phone with this Nissan car stereo via Bluetooth and you'll be rewards with hands free calls. You'll be able to quickly search contacts and when a call arrives the caller ID will display there name so you'll know whose ringing your number before you pickup. CAN bus support means your steering wheel controls for changing channels, skipping tracks, adjusting the volume and even making calls should can all be setup so you have everything you need at your fingertips. There is also a handy remote control with every extra function on hand. This Nissan car DVD player comes with 12 months warranty, brought to you by the leader in electronic devices as well as 2 Din Car stereos and in-dash media players..